The Summer Infant Multi-Use Deco Walk-Thru Gate is a functional and stylish pet gate for stairs. There are a few important aspects to keep in mind when searching for pet gates for stairs. Firstly, note that your needs will vary for gates used at the top of stairs versus gates used at the bottom of stairs. Pet gates at the top of the stairs should always be hardware mounted, rather than pressure mounted, to ensure extra stability. 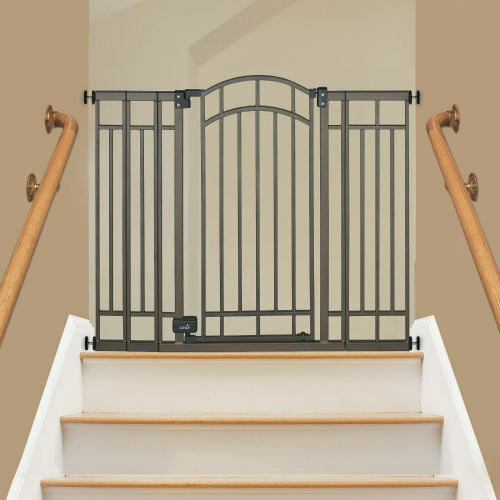 Making a gate safe and sturdy at the top of your stairs means you are going to have to put some holes in your walls. If you’re looking for top of stairs pet gates, consider a gate that has been thoroughly tested for that location and passed a certification process. The Juvenile Products Manufacturers Association, for example, certifies gates that are safe for use on stairs. This means if a gate has earned the JPMA stamp of approval you’re looking at a safe option. On the other hand, if you’re shopping for a pet gate for the bottom of your stairs you may be able to use a pressure mounted gate. On this page we have compiled gates that work for both locations, and some gates that are certified for use at the top of stairs. Gates designed for use at the top of stairs will work at the bottom as well, but not vice versa. We’ve put together a comparison chart of some of the highest rated pet gates for stairs below so you can get a sense of the options. We hope the comparisons help make your search for the right gate easier. Hopefully the chart above was helpful for you in getting a good sense of the variety of pet gates for stairs. Below we’ll go into detail on a couple of the most popular models to give you more insight. The Summer Infant Multi-Use Deco Walk-Thru Gate made our best walk through pet gates list as well. This model can be used as a pressure mounted gate, but it is also hardware mountable for use on stairs. It comes with all the hardware for mounting, which is optional for normal installations but is required for installations at the top of the stairs. The fact that you can either hardware mount or pressure mount does allow for some flexibility in how the gate is used generally, though. The Summer Infant gate is a pretty stylish option, too. Its matte bronze finish and arched doorway. boast an elegant look that is often lacking in pet gates. The gate also comes in a light beige color so you can choose the color that best suits your home’s decor. Going back to function, the door of this pet gate is a great feature. It features an automatic close mechanism that shuts the door and locks it after walking through. The lock itself is a latch that is reportedly easy to open with one hand. This gate can span spaces between 28 and 48 inches wide. There are also available extensions needed for the wider side of that range. Additionally, this model is an extra tall pet gate that stands at 36″ high. The Retract-A-Gate Safety Gate is the highest customer rated gate on our list. The high praise does come at a premium, meaning this gate is the most expensive model on out list as well. Lets go into the reasons this retractable model is worth the extra cost. First of all, the Retract-A-Gate has the official JPMA stamp of approval for use at both the top and bottom of stairs. Secondly, the Retract-A-Gate barrier is made of a high quality mesh that is sturdy and scratch resistant. It was designed with pets in mind and has been tested for cats and dogs. Thirdly, the gate was thoughtfully designed for human users. The gate offers one hand operation, and it also opens and closes quietly. If you have experience with other retractable gates you know that they can be noisy! 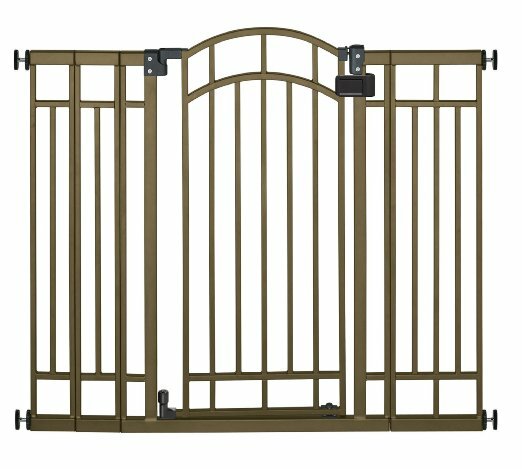 This gate is available in two sizes: a standard 52″ wide version and an extra-wide 72″ version that runs $30 more. You can choose from either clean white, cafe brown, or black for both sizes.